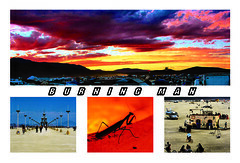 I decided to design a post card for Burningman this year. I ordered 100 of them. I designed it from pics I've taken at previous Burningmans. I think it turned out pretty good.